Mowing can be described as a defoliation process that prevents the grass developing to its maximum potential. 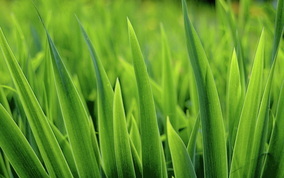 The response of grass to mowing is to grow more. Please be aware that mowing is a very important system as it can kill off some types of grasses and stimulate others. Domestic lawns should be mown on a regular basis, as infrequently cut lawns will develop undesirable grass types. There are two types of mower. A cylinder mower that traps the grass between two blades and the rotary mower which cuts by rotating a solid blade parallel to the lawn. Generally speaking the cylinder type produces a better quality cut. Your lawn should be mown little and often, removing a third of the available leaf each time. Leaving two thirds of the leaf allows the grass time to recover. The leaf is very important for photosynthesis and cutting it too short will limit its ability. Also the grass may become yellow, thin and weak. This will allow weeds and undesirable grasses to encroach.